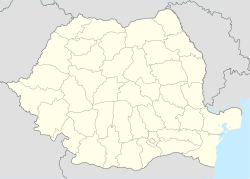 For the administrative subdivision, see Hunedoara County. For Hunedoara Timișană village, see Șagu. Hunedoara (Romanian pronunciation: [huneˈdo̯ara] ( listen); German: Eisenmarkt; Hungarian: Vajdahunyad, Hungarian pronunciation: [ˈvɒjdɒhuɲɒd] ( listen)) is a city in Hunedoara County, Transylvania, Romania. It is located in southwestern Transylvania near the Poiana Ruscă Mountains, and administers five villages: Boș (Bós), Groș (Grós), Hășdat (Hosdát; Hochstätten), Peștișu Mare (Alpestes) and Răcăștia (Rákosd). The castle history is mostly related to the Hunyadi family, being the place where John Hunyadi spent his childhood. Today the castle is being cared for by the municipality, as there are no recorded descendants of the Hunyadi that could pledge for it. Vlad Dracul, the ruler of Wallachia, the father of the notorious Vlad Dracula, was imprisoned here, as he had fallen into disgrace with Hunyadi, not providing the help promised (Dracula, who had once been traded as a hostage to the Ottomans by his own father, later became a protégé of Hunyadi, and took over Wallachia shortly before his mentor's death of fever). The castle and surroundings are often used by international film companies for the production of movies about medieval times. ^ Corbi and Voicu The citadel's remainings can still be visited today. Information provided based on a compilation of the published articles under the signature of the Mr. Sorin Preda and Horia Turcanu, corroborated with the elements provided by the professor Grigore Constantinescu and the priest Petre Grigorescu, and of the data collected from the Romanian National Archives and from the writings of Mr. Constantin Radulescu-Codin, historian, and of Mrs. Clara Laura Dumitrescu. ^ citing the medieval writer Thuroczy Müncheni Reichsarchív. Brandenburgica. c. CCIX. f. 36., citing: Dr. Karácsonyi János., page 379, Buda, 1528 márcziits 24. ^ Radu name of Wallah origin, currently a common Romanian name. ^ "Ethno-demographic Structure of Romania". The Ethnocultural Diversity Resource Center. Archived from the original on November 4, 2011. Retrieved January 2, 2011. Wikimedia Commons has media related to Hunedoara. This page was last edited on 18 February 2019, at 19:37 (UTC).